The capital of Gran Canaria and a bustling holiday resort, Las Palmas is situated on the northeastern tip of the island, between two long and lovely stretches of beach. The city was founded in 1478 and was the spot where Christopher Columbus began each of his voyages to the Americas. Much of the historic Vegueta district remains charmingly intact behind the modern apartment blocks which line the seafront, and there are many interesting ancient sights and museums to visit. The ambience is lively and the sunshine seemingly ever-present. 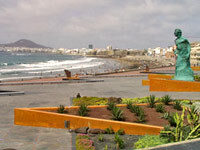 Interesting cultural offerings, fun festivals and highly renowned cuisine attract thousands of holidaymakers to Las Palmas every year and make for a memorable stay. Of course, the surrounding stretches of beach are also a big draw card, and the fact that the city is the gateway to the whole island, and the main travel hub, is an extra perk. The warm waters surrounding Las Palmas provide perfect conditions for all kinds of watersports for holidaymakers to enjoy, including sailing and boating. Many of the resorts also have their own tennis courts, golf courses and other sporting facilities. Whale watching is a popular activity and tickets can be bought from companies taking tourists out on boats for the day. Many exciting excursions to other destinations on the island are possible, by boat and by bus. Las Palmas promises some good holiday shopping for those so inclined and the city also lures travellers with an energetic nightlife; holidaymakers in search of a party should head to Plaza de Espana, in the Mesa y Lopez district.